DBS&A’s Geographic Information Systems (GIS) team will be attending the National Tribal Geographic Information Support Center’s (NTGISC) 9th Annual National Tribal GIS Conference taking place from November 5 through 9, 2018 at the Southwestern Indian Polytechnic Institute in Albuquerque, New Mexico. GIS Manager, Kenny Calhoun, GISP; GIS Technician, Samuel Romero; Senior Geochemist, Chris Wolf, P.G. ; and Staff Geologist; Chad Johannesen, P.G., co-authored a digital poster for the event, which showcases the benefits of applying a GIS to a Sand and Gravel Assessment that DBS&A performed on behalf of the Pueblo of Acoma Planning and Engineering Department. ArcGIS provided a reliable method for creating maps and performing calculations that were crucial for this assessment project. GIS Analyst, April Molina, GISP, Mr. Calhoun, and Mr. Romero will be present at the conference to discuss DBS&A’s GIS capabilities and experience working with tribal entities. Acoma has ongoing construction projects including roadways, bridges, and pipelines that require sand and gravel borrow material during construction. A new bridge project, Mesa Hill Bridge and SP 36 Road Extension Project, is in the early design phase and initial estimates indicate that over 190,000 cubic yards of aggregate will be used during the construction project. Funding was provided by the Bureau of Indian affairs (BIA), Division of Energy & Mineral Development. Using a phased approach, DBS&A evaluated the sand and gravel resources at nine sites with seven of the sites within five miles of the Mesa Hill Bridge Project. Sediment samples were collected with locations recorded using a GPS. Potential areas containing the aggregate resource were delineated as polygons within ArcGIS based on field observations and the local geology. The area was calculated for each polygon and using an assumed depth of the sediments, the sediment volume was estimated. This information was provided to Acoma for deciding which sites could be further investigated. Maps of the sites were provided to the Southern Pueblo Agency for Cultural and Biological evaluations. Acoma eliminated several of the nine sites due to cultural reasons, and DBS&A performed additional investigations at four of the remaining sites. At each site, transects were measured using a survey-grade GPS unit to help delineate the surface topography, which was compared and integrated with a digital elevation model (DEM) to ensure that surface control was adequate for calculating sediment volumes. Test pits were excavated using a back hoe to determine depth of the sediments, to characterize the lithology, and to collect samples for laboratory analyses. Samples were analyzed for their geotechnical properties following American Association of State Highway Officials (AASHTO) procedures. 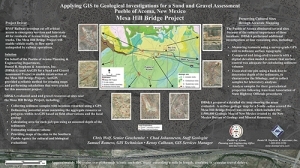 A detailed site map, showing the areas evaluated, was prepared in ArcGIS that included a surface geologic map for a five-mile radius around the Mesa Hill Bridge Project using the 1:500,000 Geologic Map of New Mexico created by the New Mexico Bureau of Geology and Mineral Resources. DBS&A prepared a detailed report that provided ArcGIS maps for each site, geologic cross-sections, laboratory data, and the geologic maps. Potential volumes of sand and gravel were calculated for each of the sites evaluated in Phase 2. This year’s conference theme, Impact of New Technologies – Flying into the Future, aims to recognize the various technologies as supporting tools to identify issues and solutions that support the management and protection of Natural Resources, Culture, Land, etc., to achieve greater community decisions that support the well being of tribal communities. Click here to learn more about the conference. DBS&A Principal Hydrogeologist and GLA President, Nicole T. Sweetland, Ph.D., P.G., will be attending this week’s California H2O Women Conference, which DBS&A is sponsoring. The invitation-only event is an opportunity for female leadership in diverse sectors of the water industry to collaborate, coordinate, educate and support each other. Taking place in Santa Barbara, California, from November 1-2, 2018, the Conference aims to help empower women to change the way California’s and the world’s most important resource is managed. DBS&A’s water resources work falls into the following areas: Water Supply Planning & Development, Hydrogeologic Analysis, Water Infrastructure Planning, and Litigation Support. This range of services is supported by our 250-person technical team that is actively engaged in projects such as Managed Aquifer Recharge, Water Recycling, Well and Wellfield Asset Management, Groundwater Management Plans/Groundwater Sustainability Plans, Stormwater Management, and Water Rights Evaluations. We were recently selected to assist the Owen Valley Groundwater Authority (OVGA) in preparing the Groundwater Sustainability Plan (GSP) for the Owens Valley Basin and its wide range of stakeholders. DBS&A Founder and Principal Hydrologist, Daniel B. Stephens, Ph.D., C.Hg., P.G., and Principal Hydrogeologist, John Dodge, P.G., will attend the American Bar Association (ABA) Section of Environment, Energy, and Resources’ Fall Conference on October 17 through 20, 2018, in San Diego, California. Learn more about DBS&A’s technical experts and environmental litigation support services. 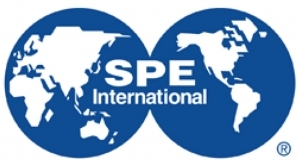 The 26th Fall Conference includes programming on topics such as: environmental, energy, and natural resource footprints; climate change; public land law; natural disasters; Superfund reform; offshore energy; and the Clean Air Act and Clean Water Act. Click here to learn more about the event. DBS&A will exhibit at the 2018 Texas Municipal League (TML) Annual Conference on October10-12, 2018, in Fort Worth, Texas. The TML Annual Conference and exhibition is a signature event of the TML and one of the nation’s largest gatherings of local government leaders, who are the decision makers for over 300 cities throughout Texas. Come meet DBS&A’s Vice President, Texas Environmental Operations Director, and Senior Scientist, Kevin Hopson, P.G. ; Senior Hydrologist, Stephanie Moore, P.G. ; and Senior Scientist, Andrew Donnelly, P.G. at exhibit #2014 to discuss solutions to water resources and environmental issues that Texas is currently facing.